The Nikkei India Manufacturing Purchasing Managers Index rose from 51.2 in May to 53.1 in June, registering the fastest improvement since December 2017. 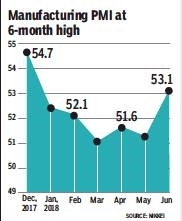 This is the 11th consecutive month that the manufacturing PMI remained above the 50-point mark. In PMI parlance, a print above 50 means expansion, while a score below that denotes contraction. Reflecting greater production requirements, manufacturing firms were encouraged to engage in purchasing activity and raise their staffing levels. On the price front, input cost inflation and output charges rose at a stronger pace, indicating that the central bank might tighten the monetary policy. In June the Reserve Bank of India had upped its retail inflation projection by 0.30 per cent and kept the policy stance in the neutral zone, even as it hiked the key rate by 0.25 per cent to 6.25 per cent. Meanwhile, business confidence eased to the weakest since last October, and the dip in optimism partly reflected concerns of a potential market slowdown in the year ahead.